Last year I was invited to demonstrate and present at one of the biggest international ceramic conferences in the world. 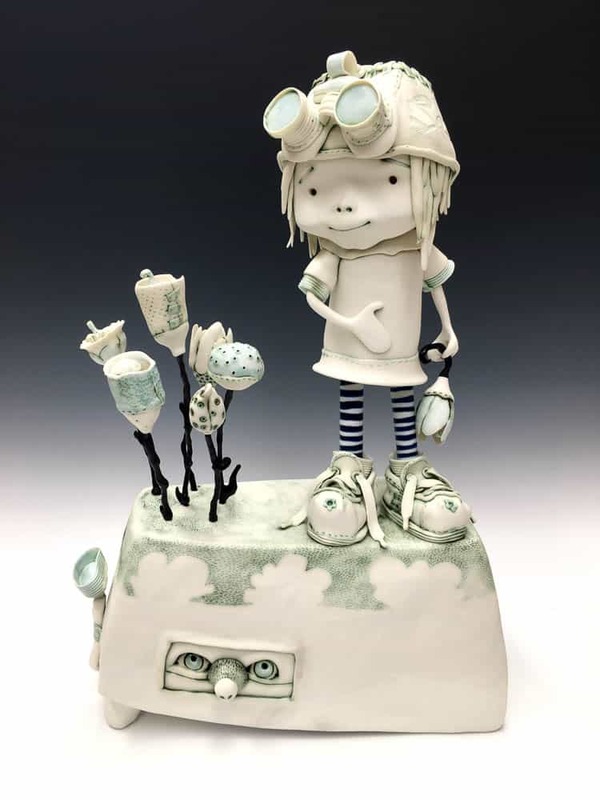 Called NCECA and held in a different city in the U.S every year it was a four-day whirl of ceramics, artists, exhibitions, demonstrations and inspiration. When I returned I wanted to create opportunities for other Australians to exhibit at and experience this international event. Travelling overseas allows artists to experience great works first hand, this is especially important for craft artists. Materiality, or what things are made of, underpins craft practice. One of the points of difference between craft practice and fine art practice is the value placed on the physicality and technical mastery of the materials. Travel is of vital importance for a vibrant, society where artists are able to experience objects not just look at them several times removed through a screen. Travel also brings fresh ideas back into our small nation keeping the gates open for exchange, preventing stagnation. I started a project called “Clay Voyage” to provide impetus and opportunity for Australian artists to travel. Linda Fahey from Yonder, a gallery in San Francisco, and I have curated an international exhibition for the 2017 NCECA in Portland, Oregon. The exhibition is called All Land / Omnus Terra. We have invited seven Australian artists and seven American artists to produce new work for the exhibition. Like the scientific expeditions of the great explorers Omnus Terra reaches out to far flung nations bringing a cargo of exotic, mysterious, mesmerising objects to a foreign shore. 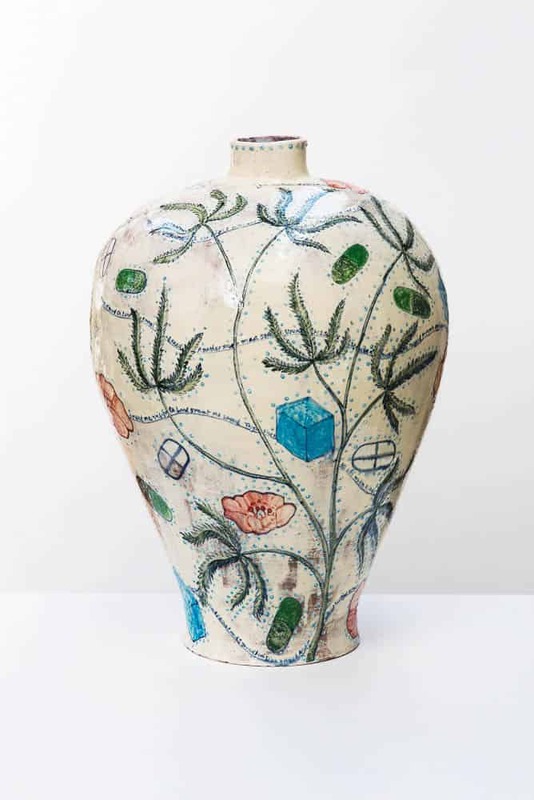 The artists explore the relationship between their landscape, ceramic history and culture, questioning the historical tropes of the ceramic medium through form and material. 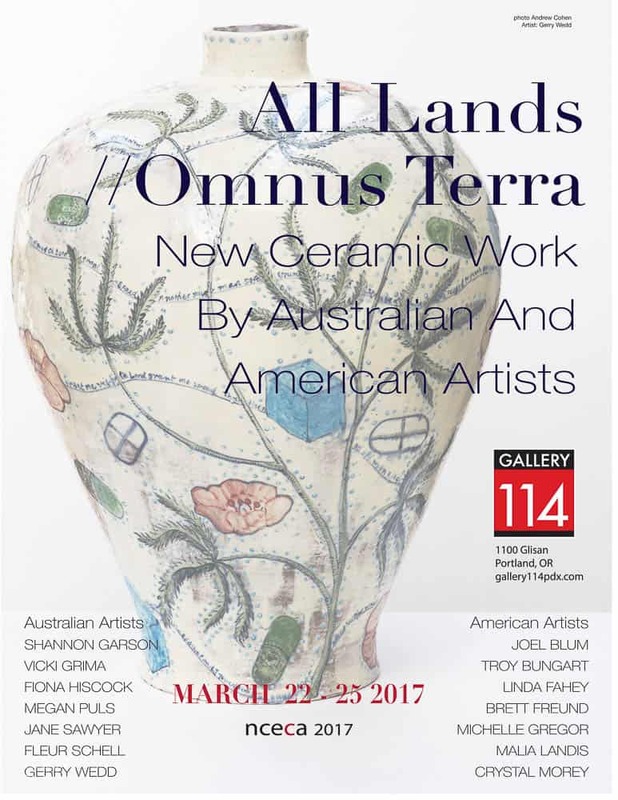 The seven Australians in Omnus Terra are part of a long history of clay and pottery migrating around the world. Ships have carried loads of pottery from one country to another since before 600 AD. The migration of pots has been accompanied by a sense of wonder and discovery, the brilliant blues and calligraphic markings on eighth and ninth century Islamic pots took inspiration from Chinese blue and white porcelain. Chinese blue and white porcelain was imported to England in the twelfth century sparking a porcelain race between the nobility of Europe to produce something as fine and translucent. 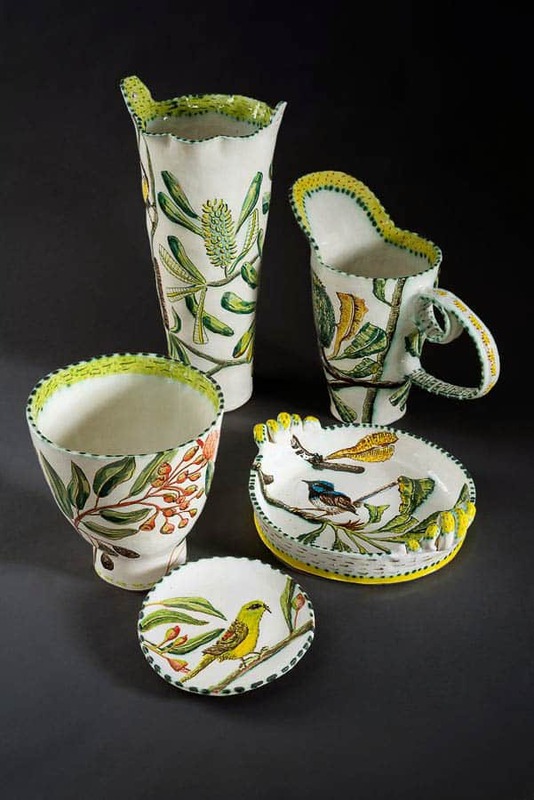 European immigrants to Australia brought bone china pots in their luggage, platters, jugs and teacups wrapped with the utmost care to make their long journey across the sea. Pottery techniques, materials and vessels have been travelling around the world inspiring and intriguing for centuries. The theme of migration and travel moves through many levels of this project. Vessel is a hydra-headed word within the English language. Originally coined to describe a household object made from gold or silver plate that could be carried from place to place vessels can also carry humans from place to place. The word ”vessel” contains the ability to carry and be carried. Like a ship or a vein, vessels can carry things away, like a cup or a bowl they can be carried full of substance by from place to place. 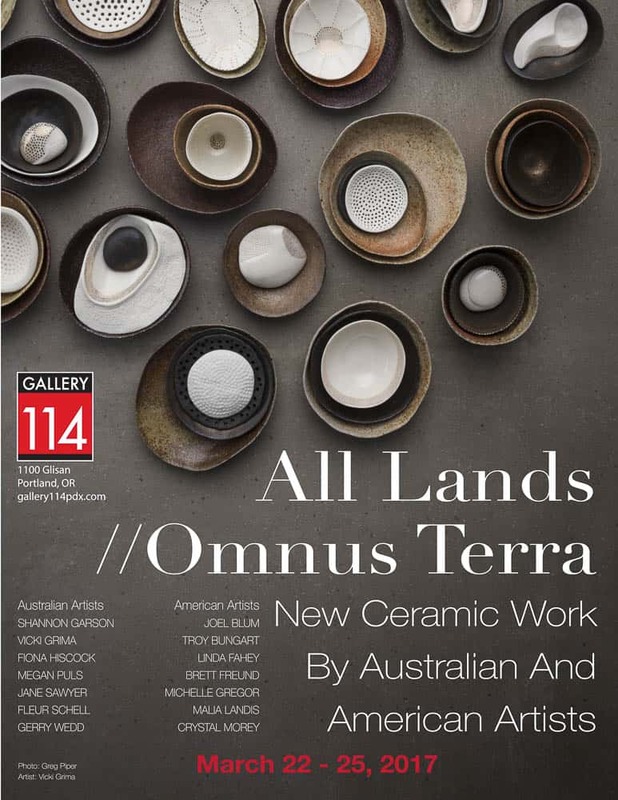 The artists in Omnus Terra are vessels carrying ideas and skills to the U.S and bringing new ones back to Australia. 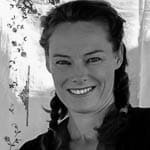 Jane Sawyer and Vicki Grima explore touch and the idea of a vessel interacting with the body. Vicki Grima makes intimate, delicate vessels from porcelain and dark clay. Small enough to be held in the hand these little pots remind me of fragile, ephemeral leaf boats, setting sail in ponds and creeks of my childhood. 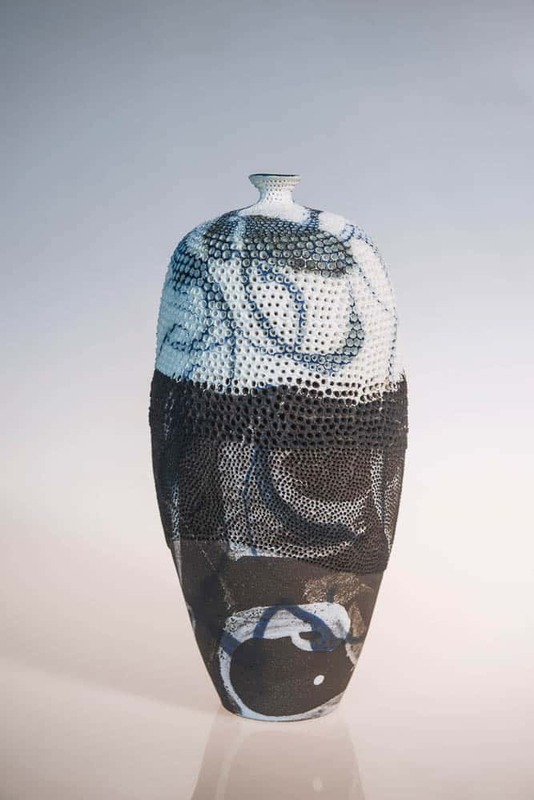 Gerry Wedd’s large vases take inspiration from those 18th century blue and white wares from China and use this convention to explore contemporary issues such as immigration and popular music. 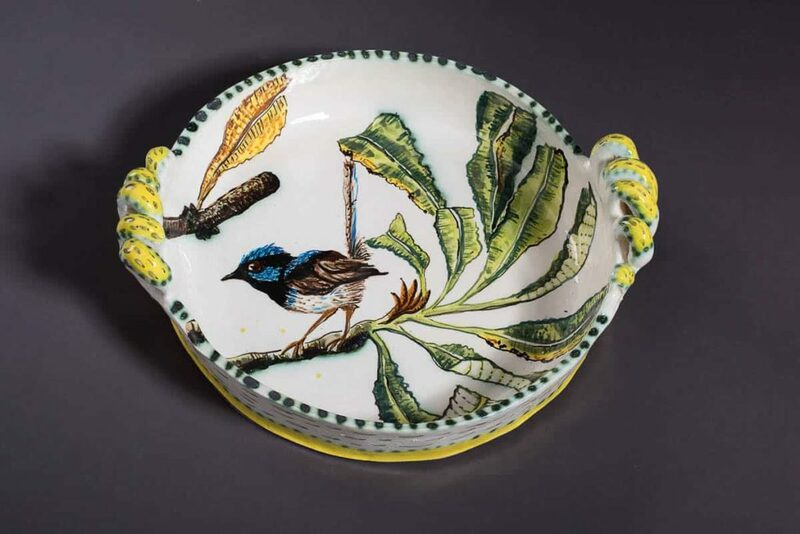 In a similar way Fiona Hiscock’s oversized gestural pots with their beautiful paintings of flora and fauna take their starting point from the historical enamelware vessels used by early settlers. 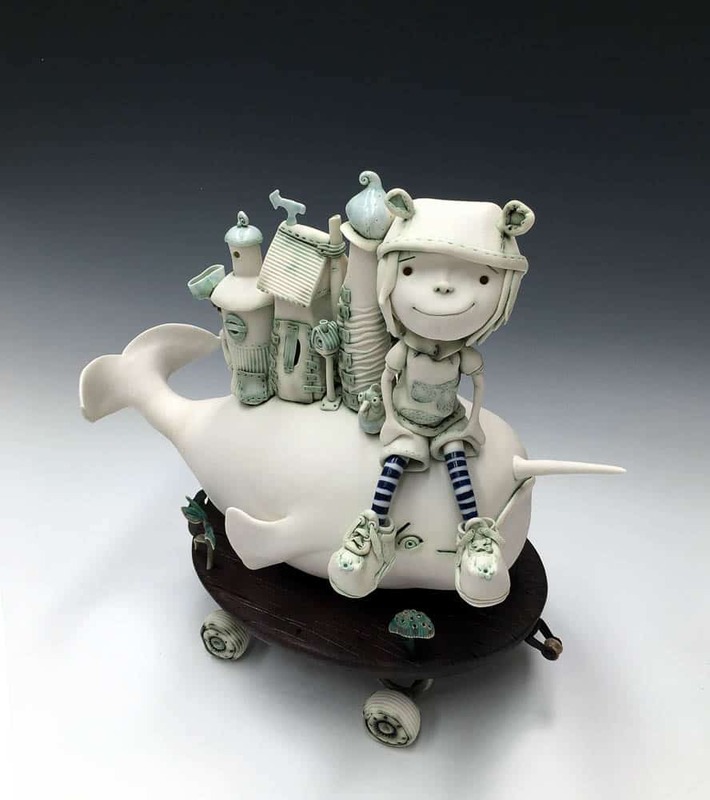 Travel, play and childhood all collide in the joyous, intricate sculptures of Fleur Schell. Fleur’s pared back palette of pale green and white draws attention to the details in her sculptures. Megan Puls is inspired by the coastline and mangrove swamps. 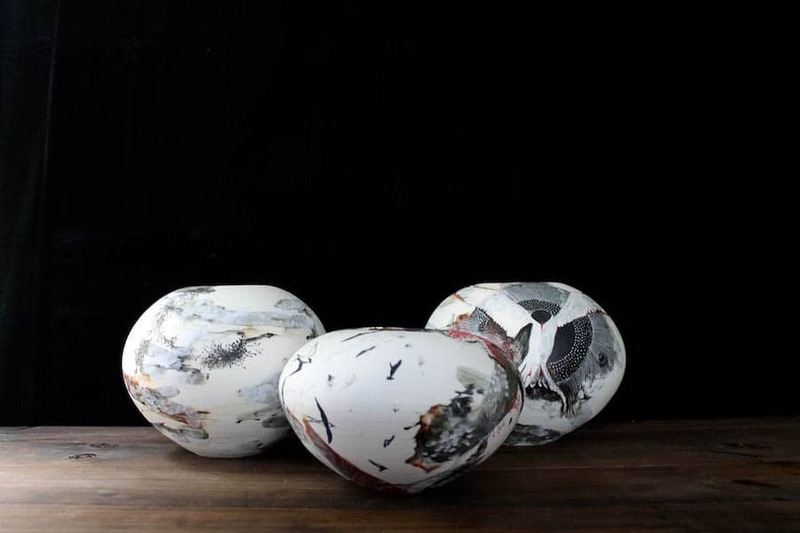 Megan’s work uses the natural world as a springboard to engage with eco-systems, in her abstract vessels of thrown porcelain and found clay. I began my work for Omnus Terra thinking about the seven Australian artists travelling so far with a load of pots carrying our ideas to a foreign shore. This led me to the epic migration of the Artic Tern that flies 40 000 kilometers between the Artic and the Antarctic every year. The vessels I made for this exhibition use drawings and paintings of the Artic Tern, abstractions of meteorological and topographic maps and details of shoreline habitat to capture the endless blue and white distance of the open ocean, the fascination of new lands and the relief of seeing the shoreline, a destination, however temporary. All Land/Omnus Terra provides a crucible for the meeting and exchange of ideas between nations. This exhibition deliberately juxtaposes work using vessel forms against the experimental and figurative, creating a space where artists from different cultures can connect and communicate through their use of clay as the Omnus Terra—the earth that connects us all. 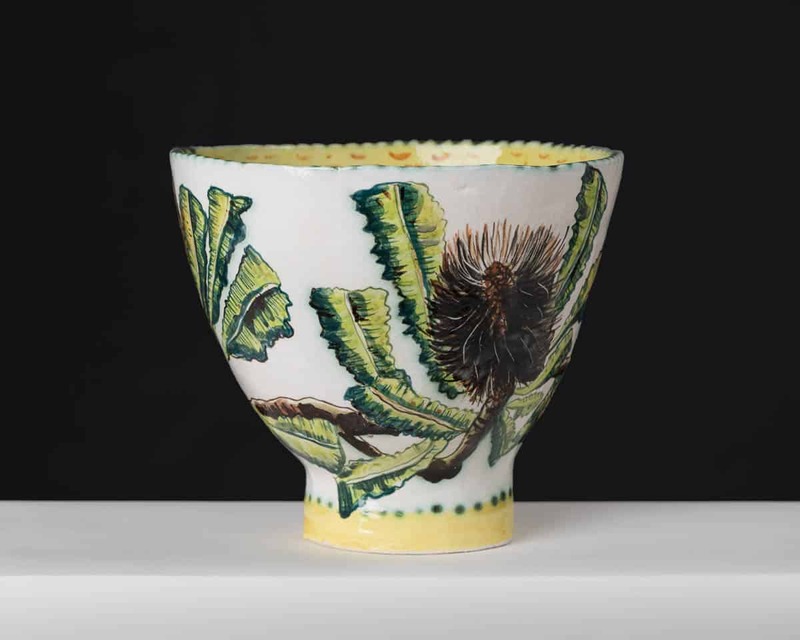 Shannon Garson is an artist and curator known for her thrown porcelain vessels decorated with intricate drawings exploring the relationship between domestic forms and the infinite variety of striations, spots, and marks found in nature. 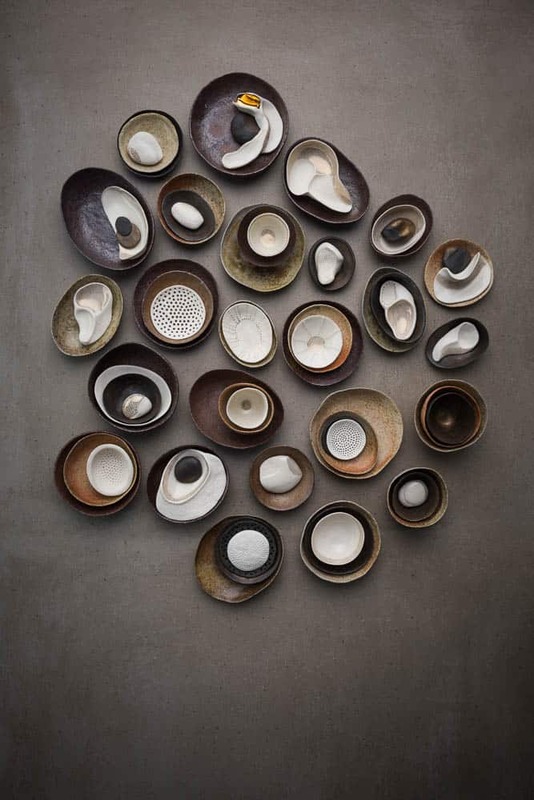 Shannon has been awarded many significant national prizes and she is regularly represented in group exhibitions of Australia’s leading ceramicists. A wonderful overview of a dream . To see images of works is exciting – to understand the passion of why, adds a deeper dimension to this amazing event. Thanks Shannon.